Beef chilli with black eyed beans, black turtle beans and red kidney beans, with a reduced fat sour cream dressing. Served with jasmine rice, sweetcorn and red quinoa. 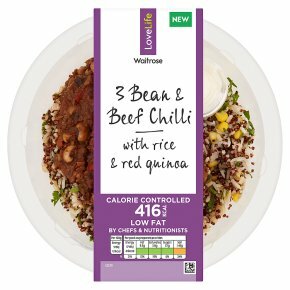 INGREDIENTS: cooked jasmine rice & red quinoa (water, jasmine rice, red quinoa), beef (13%), water, red pepper, sweetcorn, reduced fat sour cream (milk), black eyed beans, onion, tomatoes, black turtle beans, red kidney beans, tomato paste, yeast extract, coriander, cornflour, garlic purée, salt, ground cumin, beef extract, cocoa powder, smoked paprika, ground coriander, caramelised sugar powder, ground chipotle chilli powder, red chilli, orange zest, ground black pepper.